So satisfying and stimulating to the senses, this infused water recipe is very easy to make and requires a short infusion time. It’s the perfect drink for those 65 degree days when you want something to warm you up inside, but don’t feel like making hot tea. Cinnamon is also excellent for regulating blood sugar and improving alertness and concentration. 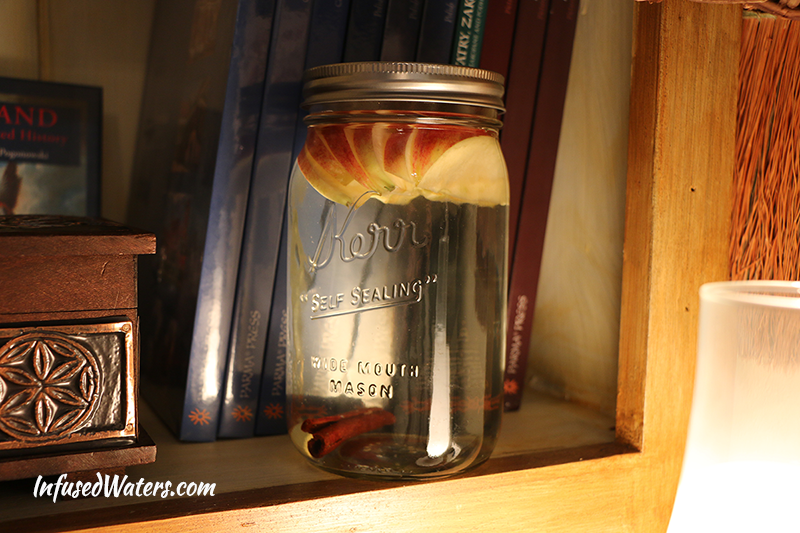 Recipe for a 32 oz Ball jar : 1/4 Gala (or red) organic apple, sliced thinly, + 1 cinnamon stick. Cover the ingredients with cold water, then put the mixture right into the fridge. Cold water and temperature is important to keep the apple slices from turning brown. Infuse for 4-24 hours (the longer, the better because apples do not infuse as readily as other fruits). Before you are ready to drink or serve the water, let it sit out at room temp for a half an hour. For this particular infusion, you’ll get loads more flavor from room temperature water than cold water. Another tip is to slice your apple thinly. Thin apple slices provide the most surface area for juices and flavor to seep out into the water. Oh, one more tip: when you drink the water about 2/3rds of the way down, refill with cold water and stick the Ball jar back in the fridge for a couple of hours. The second infusion will almost be as flavorful as the first. 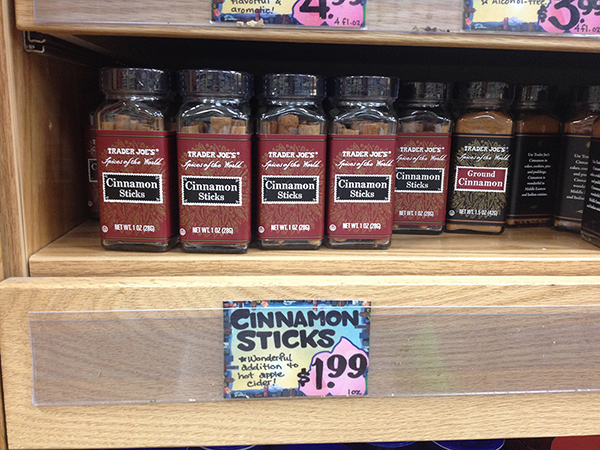 If you are worried about the price of cinnamon sticks, you can buy them at Trader Joe’s for $1.99 and you get about 10 sticks per jar. Not bad! Hi, Janelle! That’s great you want to make a healthy water for your party. The sweetest flavor in infused waters comes from strawberries, so definitely pick a recipe with strawberries in it. This is what you should do: infuse strawberries in your container the night before – as many as you want. The strawberries turn the water a really pretty pink color and add a lot of sweet flavor. Unfortunately infused strawberries also turn into little pale versions of themselves after a few hours. So, an hour before your party, remove the spent strawberries and add lemon slices. The lemon will add visual appeal and balance out the flavor. And then add ice before serving. Hope that makes sense! I’ll try to make a blog post about this recipe as this water is great for events. oh wow, i will try this, amy! and love ur tips about how to keep the apple slices from turning brown. thank you! Thanks, inggried! Hope you like the flavor of this one! I made last night and tried some later. I loved it. This morning I wanted coffee and decided to use the infused apple cinnamon water to brew it. It came out very refreshing! I used a quart mason jar but was looking for something bigger. Great to hear! If you are looking for something bigger, you might want to consider getting a glass dispenser to keep in your fridge. I do not own one of these (yet), but this glass dispenser is the best reviewed on Amazon. I love the website. I have been meaning to try infusing water for a while but have not tried it till now. I am using an old sauce jar cleaned and soaked in vinegar to remove the sauce smell. I was wondering how long to infuse the Apple cinnamon mixture? Can I eat the fruit after infusion or just better to through it out? Hi, Marla. I’m so glad you enjoy the site! If the sauce jar is glass, then you should be able to get the flavor out. Otherwise, I’d suggest buying some Ball jars at the store so that you can start fresh and also experiment with several infused water recipes at the same time. In regards to the infused fruit, you can eat it, but it will not be very firm or flavorful. Most of the flavor leaches out into the water, especially if you infuse for over 4 hours. You can infuse the Apple Cinnamon recipe for up to 24 hours. That particular recipe needs more infusion time because apples infuse so slowly in water. Hope that helps! On sunday i try this recipe. So fresh. My mom and father like this drink. Apple and cinnamon infused water tastes like “fruit ice” (Indonesia drink) my mother made because we wear cinnamon. What fruit beside apple mixed with cinnamon can we? Hi, Rachmi! I am so glad you and your family enjoyed this recipe. That is really interesting that it tastes like Indonesian fruit ice! I need to travel over there and experience it for myself 🙂 In any case, cinnamon would also go well with pears (which would require a long infusion time similar to apples), oranges (without the peel), and vanilla bean or dried vanilla sticks. If you experiment and find something you like, please do let me know. Have a great day! Hi. So I’m looking through your recipes and would like to try this one out. I ran out of cinnamon sticks, is it okay to use the powdered ones? I Bought myself a water infusion pitcher for Christmas. Now to find recipies to go with it. Thing is it is a 3qt/102oz pitcher…. Although I am excited to try it I am also intimidated!!! Can you provide a recipe for a pitcher of the apple cinnamon infused water and how long will it keep? Also, why are my mint leaves wilting in my cucumber, lemon with rinds, ginger and mint infused water? I got 9 oz of Great Value cinnamon sticks at Walmart 0n 4/10/2016 for $7.53 – there must be at LEAST 60 sticks in the container! Is it ok to sweeten the infused water with sugar, or honey? Hi, Katina. The purpose is really to use the actual sweetness from the fruit. It is better and healthier for you if you don’t use sugar or honey to sweeten it. I didn’t care for this one. The flavor was OK, though it did require melting the flavors overnight. But the thing I didn’t like the most was that the apple slices get brown really easily – that was discouraging, because part of the great thing about infuse water is that you get to see the ingredients. One note of caution – definitely use cinnamon sticks; do NOT use ground cinnamon! That first time was a disaster! Few days back i have brought a fruit infuser bottle and looking for recipes. I have found your site and liked your content. I would like more cinnamon recipes. Please suggest some more.